A few months ago I addressed a natural and releasing reaction to massage - to have a good cry! 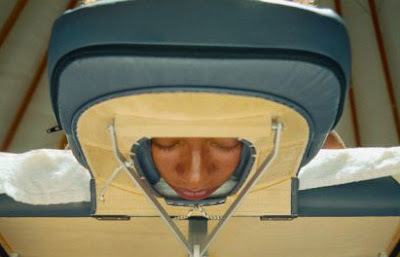 The popularity of that post gave me an idea - what other reactions do people have during a massage that are completely, absolutely human? In this series - Absolutely Human, I will explore some common, complex and supposedly taboo reactions that are totally normal during a massage session. Today we snuff out a stuffed nose! Many of my clients - no matter what the season, no matter if they are prone to allergies or sinus infections, whether or not they are skirting around a head cold - get stuffed up when face down. The truth is - your sinus cavities always have a mucus lining. It is one of the ways we purify and warm the air before it travels to our lungs. And when else in life are we laying down with our sinuses at the mercy of shear gravity? Getting congested when you are in that position is very common. Just ask for a tissue! Or if the pressure gets to be too much - get creative! Licensed massage therapists learn how to give a massage in many positions. Part of the creativity of the job is figuring out how to work your hamstrings if you get too uncomfortable (for whatever reason!) in the ideal position. Mending Hands Pro Tip: When I'm finished with all posterior work and turn the client onto their back, I put a few drops of Eucalyptus or Tea Tree oil on a tissue and place it on their chest. This is a great holistic way to open up the air passages!